1) Duration of fasts vary greatly. Due to the positioning of England on the Earth, fasts can range from being VERY short in the winters to VERY long in the summers. I remember that when I immigrated to England at the age of 11, my first couple of Ramadans were the shortest. I would break my fast as soon as I got back from school (Lucky me! Hehe!) at around 3 pm. It was like simply skipping lunch every day! Ramadans in Dubai don’t vary too greatly, in that the fast is broken in the evenings, roughly anywhere between 5 pm to 7 pm. 2) The call to break the fast is heard in different ways. The fast is broken at sunset, which is also the time that the call to Maghrib prayer is made. In Dubai, all the five Azans (call to prayer) are heard loud and clear, emanating from the minarets of mosques (There is at least one mosque in the radius of 1 kilometre), so there is no doubt about exactly when to break your fast. In England, the indication to break our fast emanated from a chunky radio that looked like a 90s mobile phone. The radio picked up the frequencies of local mosques that radiated the call to prayer into every home. However, the radio we had would always somehow mess up the frequencies and we were never actually be able to hear the Azan. This meant that we had to rely on the table of prayer timings, given by the mosques, stating at exactly what time the sun would set. Therefore, the beauty of listening to the Azan which is part of breaking one’s fast was somewhat lost in England, and simply a countdown whilst we watched the clock. 3) Ramadan is somewhat commercialised in Dubai. I suppose Ramadan in Dubai is the equivalent of Christmas in England. That is just down to the fact that Islam is a dominant religion in the East compared to the West. This has its perks, as anything related to Ramadan can be found easily and is widespread in the UAE, whether it be to do with cooking or gifts. Local brands have tapped into the month of Ramadan as a way to increase their sales and profits here. Iftar buffet deals are advertised greatly and is a lavish event not to be missed. However, I am noticing that Ramadan is also gaining popularity with industries in England, as I have come across Ramadan Calendars counting down to Eid (like Advent calendars for Christmas) and sections in the supermarket dedicated to Ramadan preparations serving dates and halal meat. 4) Moon Sighting is quite the debate in England. Since the new moon can not be easily sighted in the UK, this means that there is always a huge debate to the start date of Ramadan and the declaration of Eid too. I know the non-Muslims in England find it strange that some Muslims begin Ramadan on one day, whilst the other half begin on the next day, or even two days later. This is all due to the complicated business of preferring to follow the moon sighting of the country next door, home countries or even the holy capital of Makkah. I admit it is a shame and kind of ruins the unity of Islam. In UAE, the new moon can be sighted reasonably well and the scholars are usually united in declaring the start day of Ramadan. 5) Work timings are reduced in Dubai. The government in Dubai is kind enough to reduce the working hours for most sectors during Ramadan so that Muslims can rest, fast and pray with ease. This helps Muslims greatly because work can be quite challenging in the scorching heat whilst fasting. In England, work timings are just like any other normal time of the year. 6) Food is not allowed to be sold during the fasting hours in Dubai. I am not sure exactly how strict this ruling is and whether it is placed absolutely everywhere in the UAE, but I do know that you would be lucky to find any places selling food of any sort during the day time in Ramadan. Of course, this can be rather frustrating for Non-Muslims or even Muslims that aren’t fasting for any particular reason that reside in Dubai. In England, all shops sell food as normal, and I must admit, this can be rather tempting for Muslims, especially when you pass by a bakers shop and can smell the delicious waffles, but you know you can’t take a bite because you are fasting. Argh! 7) The ambiance during Ramadan differs. This could be perhaps due to the commercial nature that Ramadan has here, but the ambiance of Ramadan can be felt a lot more here in Dubai, than in England. The could be the combination of short working hours and advertisements regarding Ramadan special offers which makes Ramadan a “not-to-be-missed-event” or celebration in Dubai. On the other hand, in England, you wouldn’t really know it is Ramadan until a Muslim declines an offer to join you for lunch and explains that he/she is fasting. P.S. Ramadan Kareem to all the fellow Muslims around the world! May Allah reward all of us greatly for our worship this month. Have I missed any differences out? How is your experience of Ramadan compared to mine? Let me know your thoughts in the comments section below. I love this post, and your previous one. I would never have thought about the country-to-country differences like this. (I’m not Muslim, so my knowledge of Ramadan is pretty rudimentary.) Your love and faith shines through in your writing. Thank you so much. That is such a lovely thing to say! Glad you enjoyed both posts- they are the first religion related posts on my blog, so was stepping out of my “normal style” whilst writing them! Happy to get a positive response! ? I really enjoyed reading about the differences you have encountered – I always find posts like this really interesting! Thank you! Glad you enjoyed it! ? I lived in Pakistan for a few months a few years ago and we happened to be there during Ramadan. It was fascinating, as this wasn’t something I knew anything about in the UK – which is strange considering at one point I lived in Tooting, surrounded by Asians! Love the idea of the short fasts in our winter, but the opposite must have been very hard! Thanks for reading and I’m glad you enjoyed it. Yes, the short fasts were hardly a challenge, but I suppose its the same reason that it didn’t really make it feel like Ramadan because of it. It is fascinating to read about the differences you experience. We are not Muslim but did live in predominantly Muslim areas in the UK for a while and majority Muslim countries such as Turkey, Kazakhstan and Malaysia. Of these Malaysia seems the most like you describe the UAE with the shops gearing up in the same way they do for New Year and Chinese New Year. Turkey and KZ being secular states Ramadan was seen as a purely personal matter. Here it is illegal for non exempted Muslims not to observe Ramadan but all food courts are open as normal for non Muslims – Muslim workers are even expected to continue to work in those restaurants which must be very difficult. Thank you for reading and it is interesting to know about your observations in countries such as Turkey and Malaysia too! I agree, working at a restaurant whilst fasting must definitely be quite a challenge! Thank you so much for stopping by and reading! Glad it was of interest. ? Thank you so much for the positivity and I’m glad it was of interest! The Ramadan ambiance for Muslims in Dubai is really a great one. Zeyna this was so fascinating to read!! 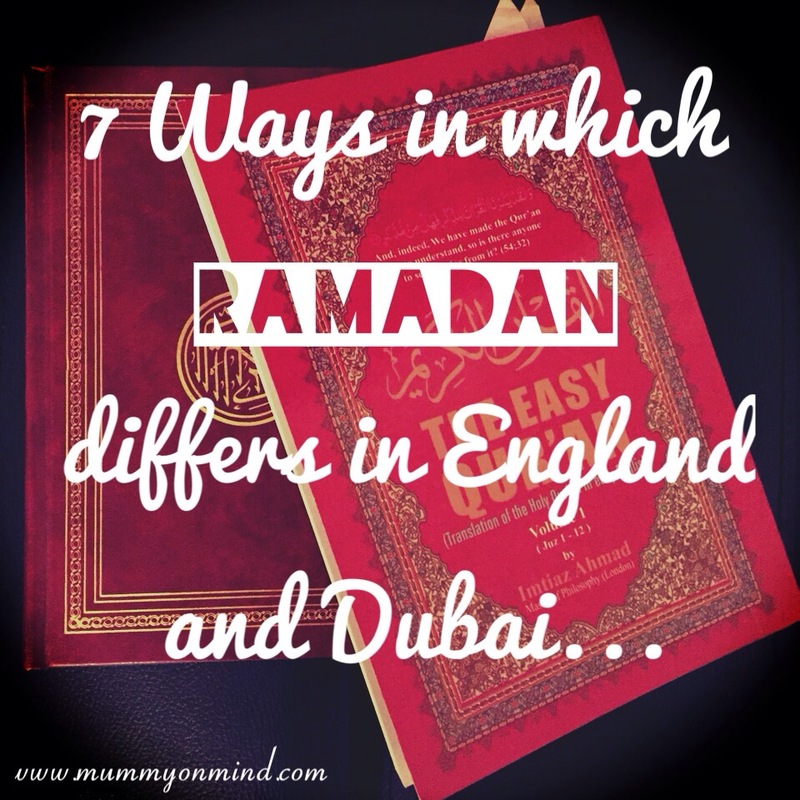 I suppose it makes sense that there would be differences in the UAE to the UK but some of these are a lot deeper than I would have ever guessed!! I never knew about it being started at different times, and I can only imagine how tempting it must be in the UK when there are people eating all around!! Thank you for sharing with #myexpatfamily I found it so interesting! Thank you so much for your positive comment! I’m so glad you found it an interesting read. Haha yes, fasting in UK is definitely more tempting than here! Thanks for hosting such a great linky! Very interesting read. I live in England and haven’t fasted this year due to being pregnant. They are soooo long I do feel for my hubby. I remember the 3pm ones too! I think I was about 13! :). Nice to discover your blog! Thank you! Haha yh I wonder when those short ones will make a comeback! (I was about 13 too!) I hope you have a safe and healthy pregnancy In sha Allah! Thanks for stopping by! ? We’ve lived in Dubai through Ramadan too and I have experienced many of the things you talk about. Thank you for sharing. I find it fascinating to try and learn about other cultures and religions. I can’t imagine what its like to fast in British summer time – such long, long days! I’m not Muslim, but I found that so interesting! 🙂 I always wonder how Ramadan works out in real life. Thank you, and I am glad you found the post worth reading! ?